Join Love And War [LAW] once again for a memorable night! 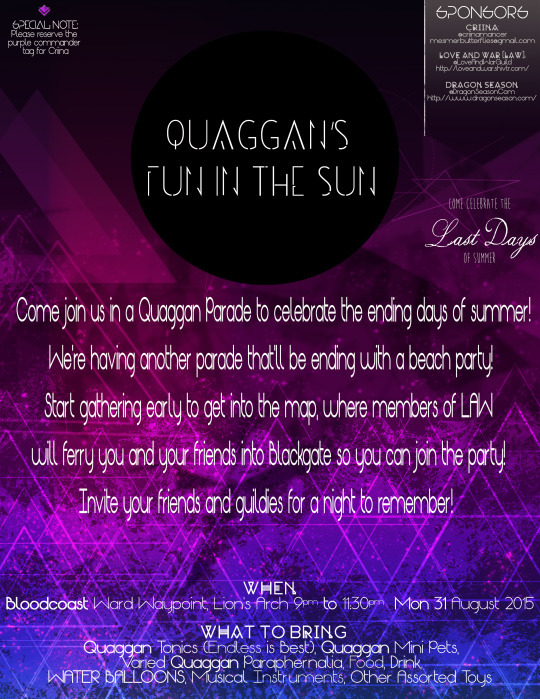 To celebrate the ending days of the summer, we are throwing a quaggan parade with a beach party at the end! All you need to bring is yourself, friends, guildies, a good attitude, and whatever quaggan goodness you can carry! What you don’t need is your worries! Take the night to leave your concerns and burdens at the Bloodcoast Ward Waypoint and march with your Guild Wars 2 family! Endless Quaggan Tonics, Quaggan mini pets, food, drinks, and WATER BALLOONS! Beach Boys music would fit the occasion as well. We had a MASSIVE turnout back in May, and we would love to see an even BIGGER crowd than last time. The party will start at 9pm EST, so be sure that you get into Lion’s Arch AT LEAST 30 minutes early so members of LAW can taxi you and your friends into the map. This is the only way we can promise you a spot in the map. Criina and the members of Love And War [LAW] will see you Monday, August 31st at 9pm! SPECIAL NOTE: Please reserve the purple commander tag for Criina. It hides in that thicket --- it's watching you now!